Hungry, horny, sleepy, curious. : The Gap. One of the roadblocks to the Tightpinkproduct is The Gap. My friend installs Ubuntu and complains about the difficulty of installing Flash or forcing WMV files to play inside of Firefox. He shouldn't have any reason to complain. All these things work. More often than not, they will work with packages living inside repositories. I, too, would complain but I've become too used to the routine of installing such packages on top of a default Linux installation (much in the same way I've become accustomed to fixing a default Windows installation or patching up OS X). The Gap is the virtual distance between the open source desktop you receive today and the open source desktop lazy dopes (like me) desire. EasyUbuntu is a step in the right direction, but for some reason they've decided to give me, the user, choices. Such choice only messes things up. Do I need the video codecs? The plug-ins? The Rar extractor? Just give me everything. MP3 playback, RARs, SVG-for-GIMP plug-ins, Flash, DVD playback, binary drivers... I want it all. The naughty things Linux (or BSD or Solaris or whatever) doesn't like but can package and redistribute should come by default. The naughtier things which lawyers only want on the internet (not on a DVD) should come at a touch of a button: "Make Linux great." 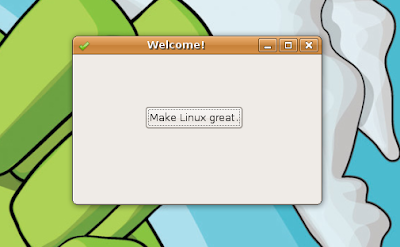 Some argue this button should read "Make Linux tolerable." I'm cool with that. The Principle of Lease Surprise is a good idea for cute, Japanese languages. It's a great idea for these infernal machines we've decided are so fundamental to business and recipe-sharing. The Tightpinkproduct could reasonably come with all these things by default. Assumption 1: distribution licensing is available for Naughty Thing X. Assumption 2: Selling laptops is still a profitable business. Obviously we need a machine which reads the happiness of users as the years pass and things improve. Let's turn the microphone on and listen for swearing! But what if someone follows Freeciv's example and builds FreeCounterStrike? Crap. We'll need some switches in there, I guess. In any case, we can feed all this data back to the super master megacomputer at debian.org and tally happiness to arrive at an appropriate i18n value for that little button. If ever there were a more perfect plan, I'm... unaware of it. Waitaminute. I've played this game before. On water droplets and wobbling windows. The tightpinkproduct has a shape.